End unit with stop-in-your-tracks view! One bedroom, TWO bath, panoramic Ocean View! 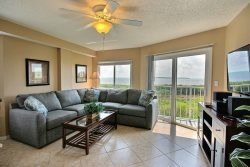 Spend your time in the living room to soak in the rapture of the fantastic, panoramic ocean view out over the wetlands! Large, flat screen TV and queen sleeper in the sectional plush sofa only steps from the private balcony. This charming one bedroom condo is located in close proximity to the pool. The dining area seats 4 with additional seating at the breakfast bar. The well-stocked kitchen features stainless appliances, wood cabinetry topped with gorgeous, solid surface counters and the open floor plan allows the chef in your party to mingle with the rest of the family. The master bedroom has a quality mattress on a king bed, flat screen TV and a comfy location for reading with perfect light coming in the bay window and an ensuite bath! Enjoy a convenient breakfast in our cozy waterfront cafe, use our free lighted tennis facilities, swim in our huge heated pool and enjoy a snack and a cocktail at the poolside bar, get some sun on our private beach or just stroll along our private boardwalk and marina. The marina, with a boat ramp, capable of handling craft up to 28ft, attracts many boaters to Ocean Pointe (Please note, boat launch and dockage require an additional fee). Fine restaurants and shopping are just minutes away, along with boating, fishing, snorkeling, diving, Everglades eco-tours, glass bottom boat reef trips, parasailing, waverunners and swimming with the dolphins. There is WiFi throughout the resort and in your apartment, spotlessly clean and everything you could want for the perfect vacation!